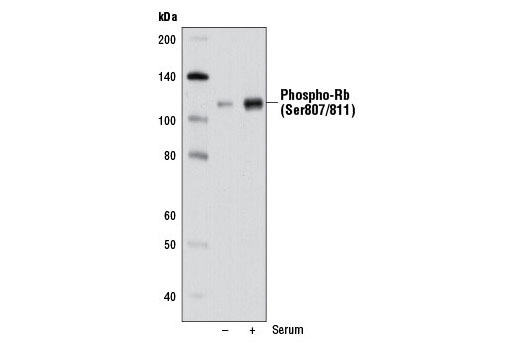 Western blot analysis of extracts from WI-38 cells, serum-starved for 3 days (-) or serum-starved for 3 days followed by treatment with 10% serum for 2 days (+), using Phospho-Rb (Ser780) (D59B7) Rabbit mAb. 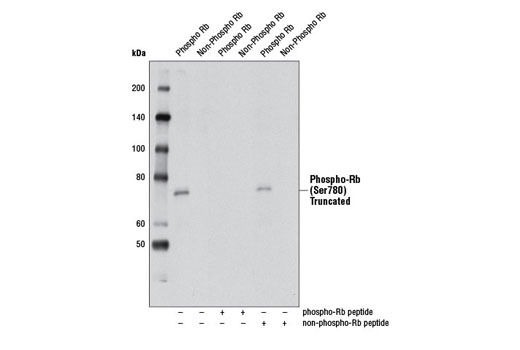 Western blot analysis of extracts from MCF7 cells, untreated (-) or treated with calf intestinal phosphatase (CIP) and λ phosphatase (+), using Phospho-Rb (Ser807/811) (D20B12) XP® Rabbit mAb (upper) or Rb (4H1) Mouse mAb #9309 (lower). Western blot analysis of extracts from HeLa cells, transfected with 100 nM SignalSilence® Control siRNA (Fluorescein Conjugate) #6201 (-), SignalSilence® Rb siRNA I #6451 (+) or SignalSilence® Rb siRNA II (+), using Rb (4H1) Mouse mAb #9309 and α-Tubulin (11H10) Rabbit mAb #2125. 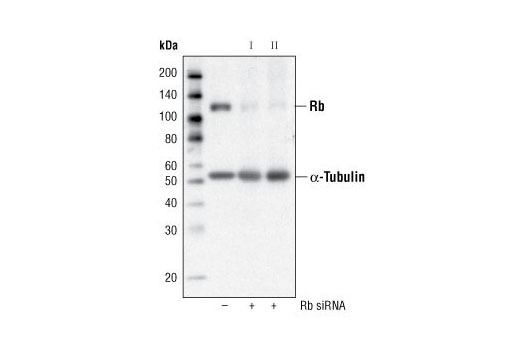 The Rb (4H1) Mouse mAb confirms silencing of Rb expression, while the α-Tubulin (11H10) Rabbit mAb is used to control for loading and specificity of Rb siRNA. 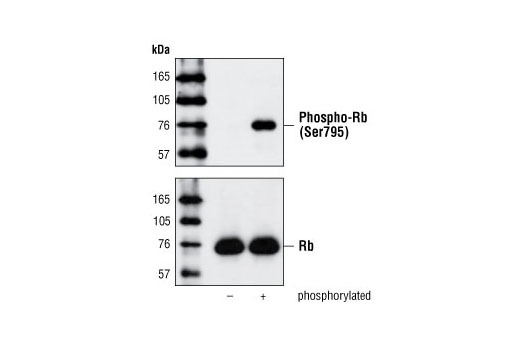 Western blot analysis of phosphorylated or nonphosphorylated recombinant, truncated Rb, without or with Rb blocking peptide, using Phospho-Rb (Ser780) (D59B7) Rabbit mAb. 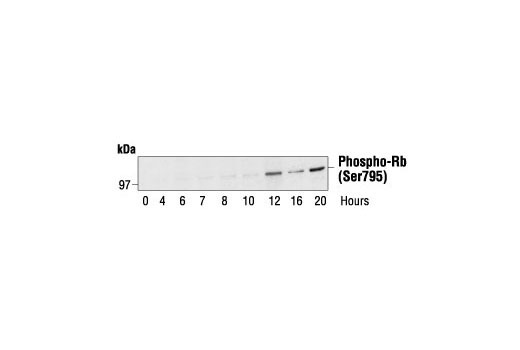 Western blot analysis of Rb Control Protein #9303, using Phospho-Rb (Ser795) Antibody (upper) or Rb (4H1) mAb #9309 (lower). 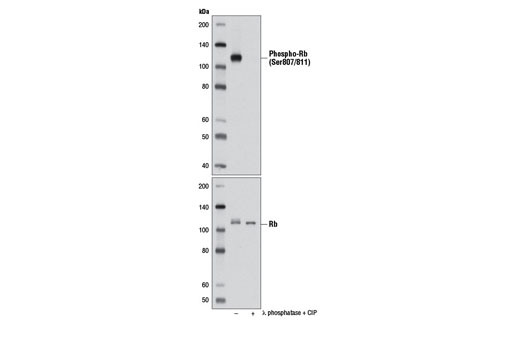 Western blot analysis of extracts from WI-38 cells, serum-starved for 3 days (-) or serum-starved for 3 days followed by treatment with 10% serum for 2 days (+), using Phospho-Rb (Ser807/811) (D20B12) XP® Rabbit mAb. 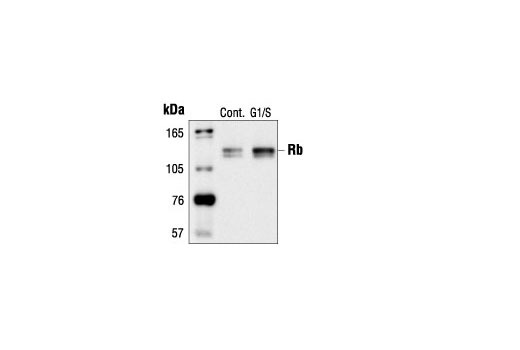 Western blot analysis of extracts from COS-7 cells, untreated or hydroxyurea-treated (G1/S), using Rb (4H1) Mouse mAb. 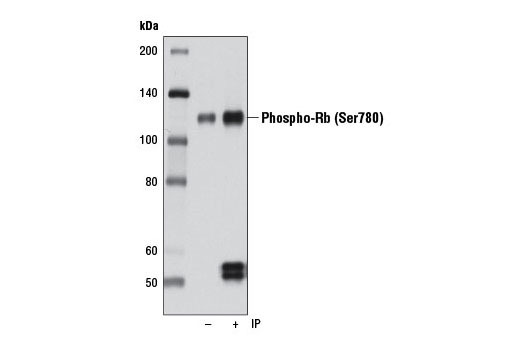 Immunoprecipitation of phospho-Rb (Ser780) from WI-38 cell extracts using Phospho-Rb (Ser780) (D59B7) Rabbit mAb (lane 2). 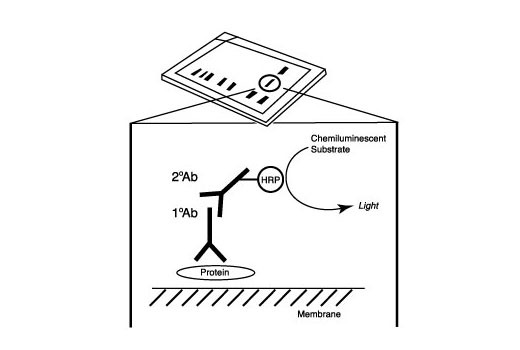 Western blot was performed using the same antibody. Lane 1 is 10% input. 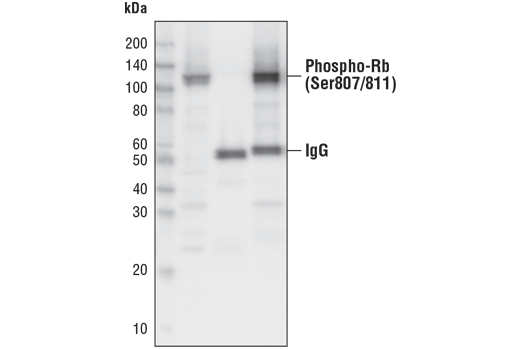 Immunoprecipitation of phospho-Rb (Ser807/811) from Cos cell extracts using Rabbit (DA1E) mAb IgG XP® Isotype Control #3900 (lane 2) or Phospho-Rb (Ser807/811) (D20B12) XP® Rabbit mAb (lane 3). Lane 1 is 10% input. 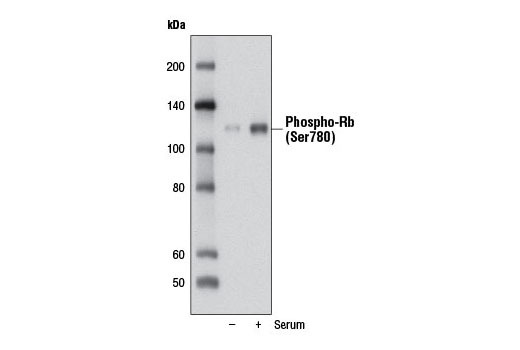 Western blot analysis was performed using Phospho-Rb (Ser807/811) (D20B12) XP® Rabbit mAb. 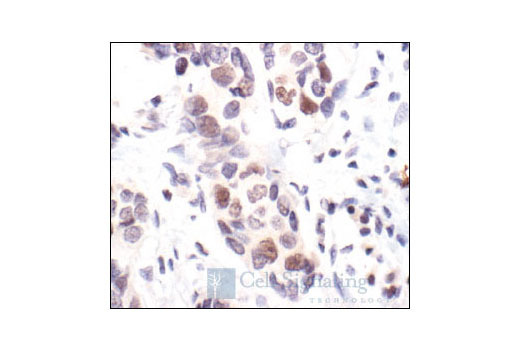 Immunohistochemical analysis of paraffin-embedded human breast carcinoma, showing nuclear localization, using Rb (4H1) Mouse mAb. 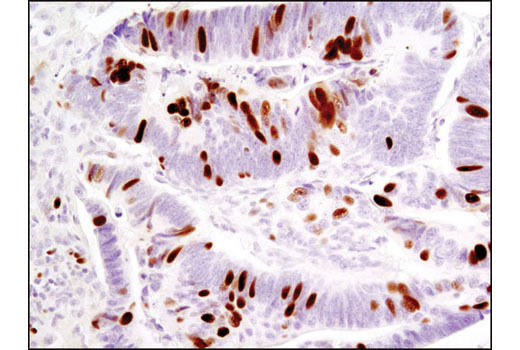 Immunohistochemical analysis of paraffin-embedded human colon carcinoma using Phospho-Rb (Ser807/811) (D20B12) XP® Rabbit mAb. 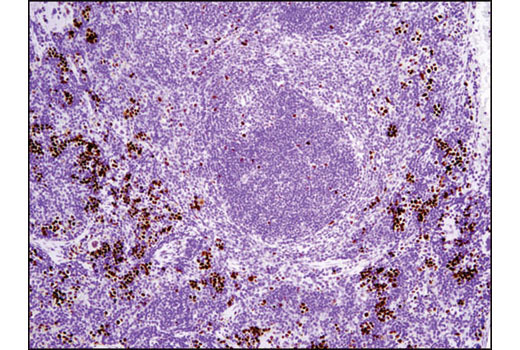 Immunohistochemical analysis of paraffin-embedded human lung carcinoma, using Rb (4H1) Mouse mAb. 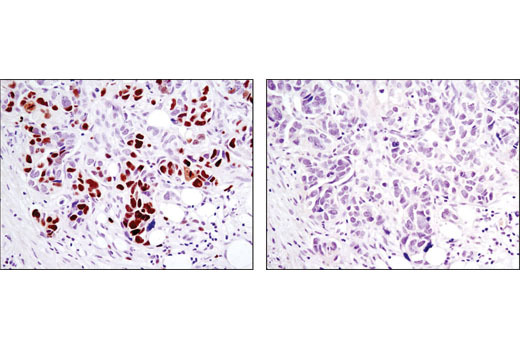 Immunohistochemical analysis of paraffin-embedded human lung carcinoma, control (left) or λ phosphatase-treated (right), using Phospho-Rb (Ser807/811) (D20B12) XP® Rabbit mAb. Flow cytometric analysis of Jurkat cells, using Rb (4H1) Mouse mAb versus propidium iodide (DNA content). The box indicates Rb positive cells. 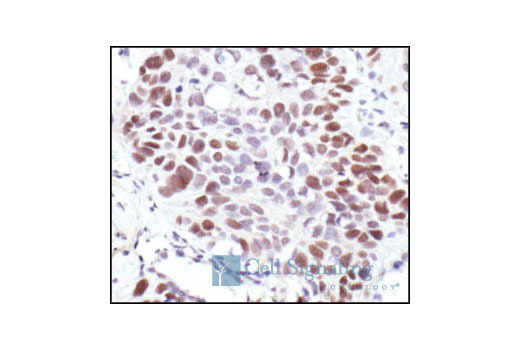 Immunohistochemical analysis of paraffin-embedded mouse spleen using Phospho-Rb (Ser807/811) (D20B12) XP® Rabbit mAb. Confocal immunofluorescent image of SH-SY5Y cells, using RB (4H1) Mouse mAb (green). Actin filaments have been labeled with Alexa Fluor® 555 phalloidin (red). 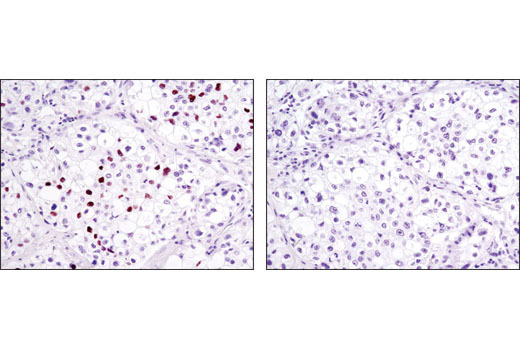 Immunohistochemical analysis of paraffin-embedded human ovarian serous adenocarcinoma using Phospho-Rb (Ser807/811) (D20B12) XP® Rabbit mAb in the presence of control peptide (left) or antigen-specific peptide (right). 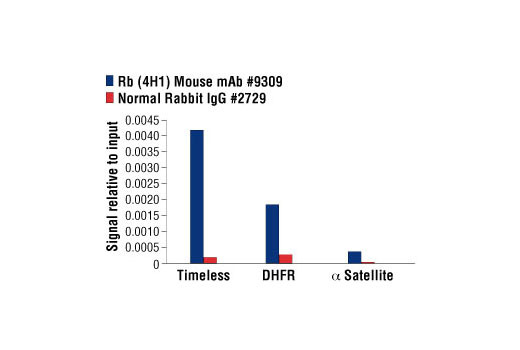 Chromatin immunoprecipitations were performed with cross-linked chromatin from Raji cells and either Rb (4H1) Mouse mAb or Normal Rabbit IgG #2729 using SimpleChIP® Enzymatic Chromatin IP Kit (Magnetic Beads) #9003. The enriched DNA was quantified by real-time PCR using using SimpleChIP® Human Timeless Intron 1 Primers #7001, human DHFR promoter primers, and SimpleChIP® Human α Satellite Repeat Primers #4486. The amount of immunoprecipitated DNA in each sample is represented as signal relative to the total amount of input chromatin, which is equivalent to one. 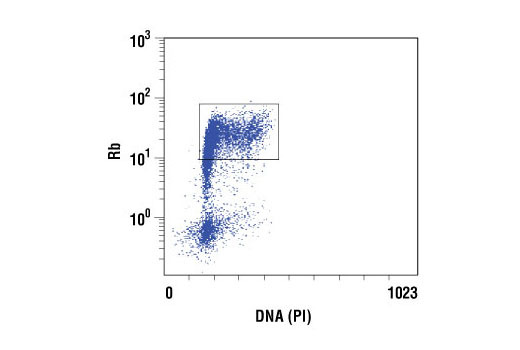 Flow cytometric analysis of Jurkat cells using Phospho-Rb (Ser807/811) (D20B12) XP® Rabbit mAb compared to Propidium Iodide (PI)/RNase Staining Solution #4087. 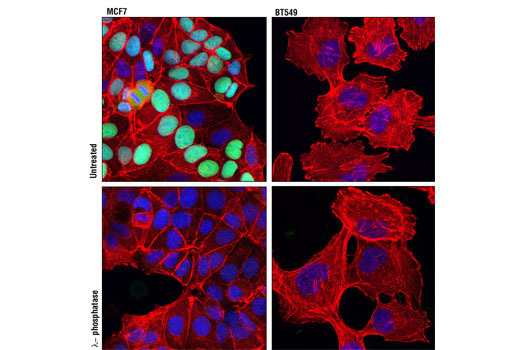 Confocal immunofluorescent analysis of MCF7 (left) and BT-549 (right) cells, untreated (upper) or λ phosphatase-treated (lower) using Phospho-Rb (Ser807/Ser811) (D20B12) XP® Rabbit mAb (green). Actin filaments were labeled with DY-554 phalloidin (red). Blue pseudocolor = DRAQ5® #4084 (fluorescent DNA dye). 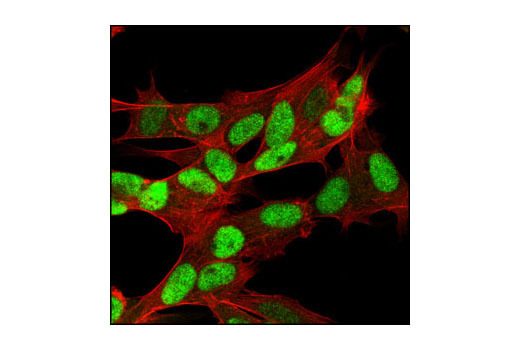 The Rb Antibody Sampler Kit provides reagents and protocols to investigate cell cycle progression within cells. The kit contains primary and secondary antibodies to perform two Western blot experiments with each antibody.